The Helia Bi-Color LED light offers the flexibility of color temperatures ranging from 2700K to 5600K for any shooting situation. The 4-inch Fresnel lens can focus from 60-degree flood to 15-degree spot. With a high CRI and TLCI, the Helia gives shooters all the color they're looking for and more. The large digital display allows you to move through the menus and tweak settings with ease. The flicker feature can be tuned to any frequency. 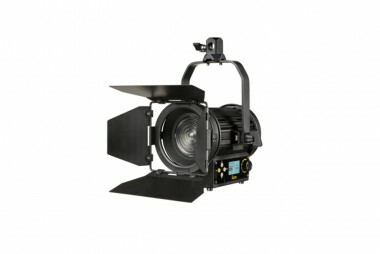 The HF40 light can be powered with a pro battery and comes with a V-mount battery plate and DC cable. It also comes with barn doors and AC power cable. -Fixture Size: 8.5 x 7.5 x 13 in.